Hot Toys make some of the most detailed superhero and movie collectibles currently available. From Terminator and Aliens through to Iron Man and Batman, Hot Toys has something for every collector. 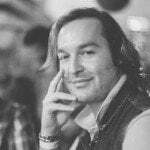 As someone who is lucky enough to own some Hot Toys collectibles, I can attest to the craftsmanship and care that is taken to create each limited edition collectible. For this reason, Vamers now offers limited edition Hot Toys collectibles for retail to the people of South Africa. If you are interested in the following Hot Toys collectibles or if you are looking for others, please feel free to browse our large selection of Hot Toys Collectibles at the Vamers Store. 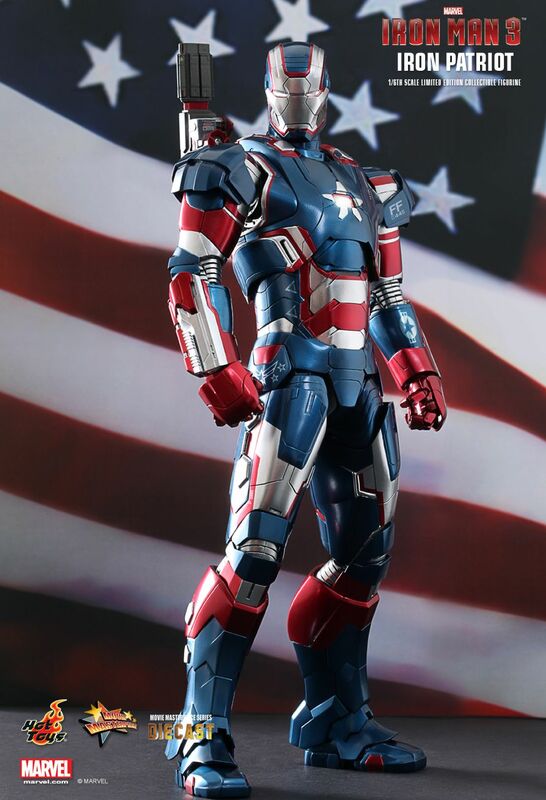 The Iron Patriot, inspired by the Iron Man 3 film, is the first limited edition figurine in the Hot Toys Movie Masterpiece Series of Diecast collectibles. What this means is that this Iron Patriot collectible is the first figurine to be made from actual metal rather than simply having been painted with metallic paint. The Iron Man 3: Iron Patriot Hot Toys Limited Edition collectible is now available at Vamers Store. Armed and ready! The Eagle has landed!The Iron Man 3 movie has become the talk of the town. Specialized in highly detailed and movie-accurate Iron Man collectible figures and established an indivisible relationship with Iron Man since the first Iron Man movie, Hot Toys is proud to present the brand-new character – the Protector of Liberty which is well fortified of military strength and technological superiority – the 1/6th scale Iron Patriot Limited Edition Collectible Figurine from the Iron Man 3 movie from the MMS Diecast Series.Leading the MMS Diecast Series is the iconic Iron Man 3 Series, in which the collectible figures are made of diecast material, specially designed to look more like the realistic Iron Man characters in the movie. The MMS Diecast Series will bring fans to the next level of authenticity, focusing on the materials, fine details and engineering of the Iron Man collectible figures, while some of the parts can be shared between our MMS and Diorama Series for displaying together in 1/6th scale. More collectibles from the Iron Man 3 will be coming from the MMS Diecast Series!The movie-accurate Iron Patriot Collectible Figurine is highly detailed and fully deployed, specially crafted based on the image of Don Cheadle as Iron Patriot in the movie. The 1/6th scale Iron Patriot Limited Edition Collectible Figurine has the following special features: – Authentic and detailed fully realized likeness of Don Cheadle as Iron Patriot in the Iron Man 3 movie – Head sculpt with helmet with authentic likeness of Don Cheadle as Iron Patriot in the movie – Alternate helmeted head with light-up function – Approximately 31 cm tall – Over 36 points of articulations – Contains diecast material – Metallic red, white and blue star spangled armor – LED-lighted eyes and RT on chest (white light, battery operated) – Three (3) pairs of interchangeable palms including: One (1) pair with improved articulations, movable fingers and light-up repulsors (white light, battery operated) One (1) pair of open palms with light-up repulsors (white light, battery operated) One (1) pair of fists Weapon: – One (1) rotatable machine gun at the backAccessory: – LED light-up figure stand with Iron Patriot nameplate and movie logo (white light, battery operated)Artists: – Head Sculpted by Kojun – Head Painted by JC. Hong – Head Art Directed by JC. Hong**Prototype shown, final product may be slightly different **Product details could be subjected to change without further notice **Battery included for collectible figure, button cells are required **Battery not included for figure stand, 2A batteries (2 pieces) are requiredRelease date: Q4, 2013 TM & © 2013 Marvel & Subs.© 2013 Hot Toys Limited. All Rights Reserved. 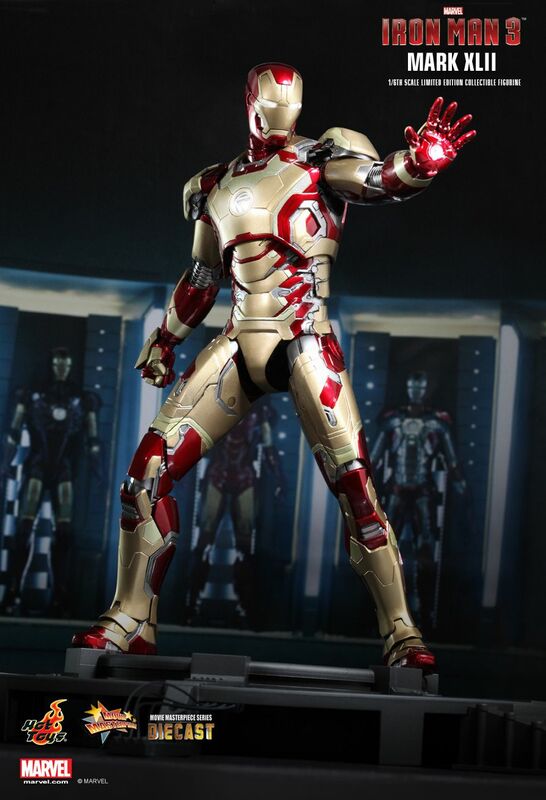 The Mark XLII, inspired by the Iron Man 3 film, is the second limited edition figurine in the Hot Toys Movie Masterpiece Series of Diecast collectibles. What this means is that this Mark XLII collectible is the second figurine to be made from actual metal rather than simply having been painted with metallic paint. The Iron Man 3: Mark XLII Hot Toys Limited Edition collectible is now available at Vamers Store. Marvel’s Iron Man 3 is coming to town this month and Hot Toys is proud to present the 1/6th scale Mark XLII Limited Edition Collectible Figurine from the Iron Man 3 movie for the MMS Diecast Series. This is only the second collectible to be introduced in our premium Diecast Series. Leading the MMS Diecast Series is the iconic Iron Man 3 Series, in which the collectible figures are made of diecast material, specially designed to look more closely to the realistic Iron Man characters in the movie. The MMS Diecast Series will bring fans to the next level of authenticity, focusing on the materials, fine details and engineering of the Iron Man collectible figures, while some of the parts can be shared between our MMS and Diorama Series for displaying together in 1/6th scale. More collectibles from Iron Man 3 will be coming from the MMS Diecast Series! The movie-accurate Mark XLII Collectible Figurine is highly detailed and fully deployed, specially crafted based on the image of Robert Downey Jr. as Mark XLII in the movie, highlighting the highly detailed head sculpt, metallic red, golden and silver well equipped armor, light-up functions. Hong Kong fans can visit Hot Toy’s Hong Kong Official Store – Toy Hunters to pre-order on April 5-6, 2013 for VIP customers, and April 7, 2013 onwards for VIP and non-VIP customers. The 1/6th scale Mark XLII Limited Edition Collectible Figurine specially features: – Authentic and detailed fully realized likeness of Mark XLII in the movie – Battle damaged head sculpt with helmet with authentic likeness of Robert Downey Jr. as Mark XLII in the movie – Alternate helmeted head with light-up function – Approximately 31 cm tall – Over 36 points of articulations – Special features on armor: – LED-lighted eyes and circle-shaped RT on chest (white light, battery operated) – One (1) interchangeable battle damaged mask – One (1) pair of damaged shoulder armor – One (1) chest armor – One (1) damaged chest armor – One (1) damaged biceps armor – One (1) pair of damaged forearm armor – Three (3) pairs of interchangeable palms including: – One (1) pair with improved articulations, movable fingers and light-up repulsors (white light, battery operated) – One (1) pair of forceful fists – One (1) pair of battle palms with light-up repulsor (white light, battery operated) – Improved articulations on waist armor which allow flexible movement – Fully deployed air flaps at back of the armor – Metallic red, gold and silver colored painting on armorAccessory: – LED light-up figure stand with Mark XLII nameplate and movie logo (white light, battery operated)Artists: – Head Sculpted by Kojun & Lee So Young – Head Painted by JC. Hong – Head Art Directed by JC. Hong**Prototype shown is not final, pending licensor approval **Product details could be subjected to change without further notice **Battery included for collectible figure, button cells are required **Battery not included for figure stand, 2A batteries (2 pieces) are requiredRelease date: Q1, 2014 TM & © 2013 Marvel & Subs. © 2013 Hot Toys Limited. All Rights Reserved.